Train your dog not to pull on the lead with the award winning Canny Collar dog walking training aid, to help control dogs and stop them pulling on the lead in a kind, safe and effective way. 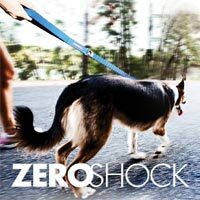 Makes lead training your dog easy and gives you complete control over who takes who for a walk! 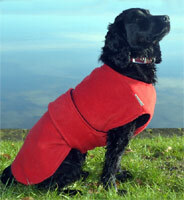 Within minutes your dog will be walking happily by your side. 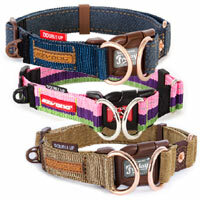 The Canny Collar is vet approved with an innovative design that makes dog walking training safe, gentle and effective. 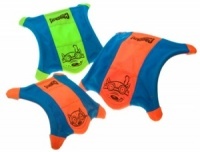 It will be quickly accepted by your dog, is simple to fit and easy to use. Your dog can still pant and drink while wearing Canny Collar and there is no harsh jerking or pulling. The innovative Canny Collar is made up of a simple, conventional collar with a slip line that fits around the muzzle so your dog is less restricted and more comfortable. 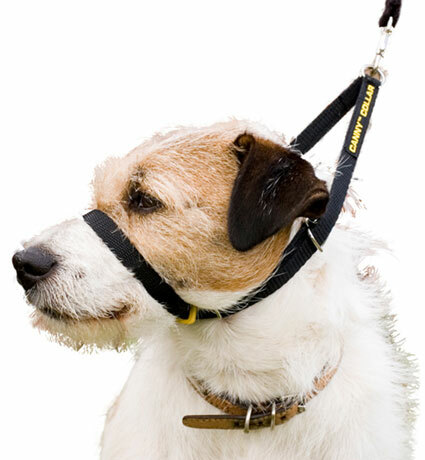 It works by a simple pressure and release system to stop your dog pulling. The lead is attached to a slip line behind your dog’s head which then fits over the muzzle. When your dog pulls, gentle pressure is applied to the bridge of their nose. As soon as the pulling stops, the pressure is released. 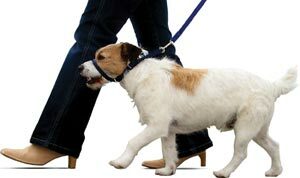 This method of lead training means your dog quickly realises that by walking at your side and not pulling on the lead, both of you can enjoy your walk. To find the best size for your dog, consult the table below. The Canny Collar must fit snugly. It should be fastened so that it cannot slip over your dog’s head. This will mean that it should be tighter and higher than a conventional collar. 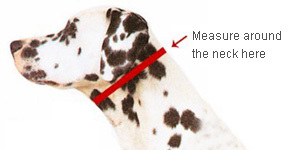 Take a tape and measure around your dog's neck snugly, just behind the ears. Then choose the correct size using the table below. If you dog is between sizes, the maker advises going up a size. Encourages my Parson Russell to walk without pulling my arm out. The piece that goes over his nose is rather long so I have put some extra rings on the collar to keep it in place, which helps to prevent him getting it off. He is becoming used to it, so short lead walks are much more pleasant. I would recommend it. We have never been able to get our dog to stop pulling - until now. The Canny collar really does work. Provided he can still chew is ball, our dog doesn't even try to get it off. Not only was the service 5 stars but the help and advice was second to none. 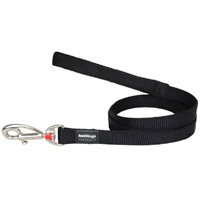 I needed a lead that would stop my huge rottiweiler from pulling and was clueless. We both enjoy are walks now. The canny collar had instantant results and is excellent quality . Thank you so much. Considering it is for a nearly 2 year old Border Collie, that thinks she is 6 months old , worked perfectly. Just take your time to get used to the way it's supposed to go on, do as the instructions say and it will be fine. Don't think any dog likes a strap going over the top of its mouth, but ours quickly accepted the Canny Collar. I ordered the canny collar for my german shepherd x labrador pup. I followed the measurement instructions but somehow still managed to order the wrong size, typically me. The next morning, after realising i should have ordered a size bigger, i emailed customer service to let them know i had made a mistake and would like to change the order before it was dispatched. Within 5 mins i had a reply saying that my order had already been dispatched. I was very impressed that i had a response to my query so far and also that my order had been processed equally as fast!! So i was instructed on what to do to exchange my item. I received the item and returned it the same day. And amazingly again, i received my exchanged item (the correct size this time) the next day. I am so pleased with the excellent level of service, super fast delivery and communication. I cannot recommend this website highly enough. I will definitely be purchasing more for my dogs in the future. All companies should take a lesson from you guys. Thank you very much! Great service, I had to send them back due to over sizing my pooches and they arrived the very next day. i wasn't sure if this would work on my 1 year old german shepherd so i called the lady who runs d for dog with a couple of questions.. she was very helpfully and i'm delighted to say the collar works a treat. My dog doesn't like wearing it but she is getting used to it and its just such a nice change being able to walk her without her pulling on the lead. At 30Kg+ she was getting hard to handle.! My very strong labrador has pulled me over several times, sometimes with nasty consequences. We have been through other collars and harnesses and he has always been good to start with then found a houdini trick to to get free of it or just decided to pull anyway. A recent problem with my neck and shoulders meant I needed to look again. I'm very pleased with the Canny Collar. He tried to get it off his nose during a few walks, but with encouragement accepted it and now I enjoy our walks much more. Excellent buy, and amazing service - ordered in the afternoon and received next morning! Thank you.